No detail went unnoticed in Ashley and Mark’s recent wedding at The Four Seasons. Their big day was filled with plenty of exciting moments, stunning décor by Lamsback, and plenty of love to go around. We enjoyed documenting Ashley and Mark’s special day, and totally loved all of the personal touches they put in (yes, of course we noticed!). Ashley’s customized “Bride” robe was the perfect wardrobe as she prepared during hair and make up. 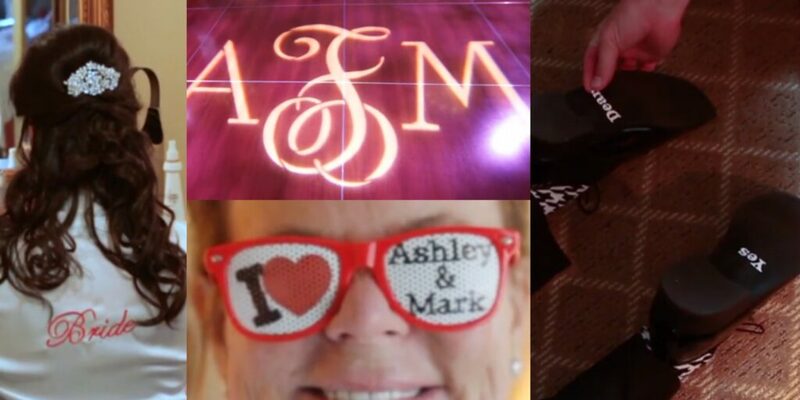 The personalized initials on the dance floor and customized sunglasses were also two favorites. Mark was sporting the words “Yes dear” underneath his shoes. All of these little touches added up to make it a fabulous and fun occasion. Please enjoy a preview from Ashley and Mark’s big day below. As the Winter months approach, we try to save a few great Summer weddings to share. It helps get us through the chilly season! Congress Hall was the perfect place for Gina and Michael to celebrate their wedding day. Family and friends filled the place with smiles as they watched our lovely bride and groom tie the knot. It was clear from the start that these two were meant to be. Video One was pleased to be a part of such a great wedding. Congrats to Gina & Michael from all of us here at Video One!